1 of 1 In food processor, combine arugula, basil, nuts and garlic. Process 1 minute. Gradually add oil and process until blended. Add cheese and salt; process until smooth. Set aside 1 cup for recipe. Refrigerate remainder for another use (up to 1 week). 1 of 2 Place salmon fillet in a large nonstick skillet. Add wine and bring to a boil over medium-high heat. Reduce heat to medium-low and simmer, covered, for 10 minutes or until fish flakes easily. Remove from poaching liquid; keep warm. Discard liquid. 2 of 2 Meanwhile, cook pasta following package directions, 3 minutes. Drain, reserving 1/2 cup of the water. 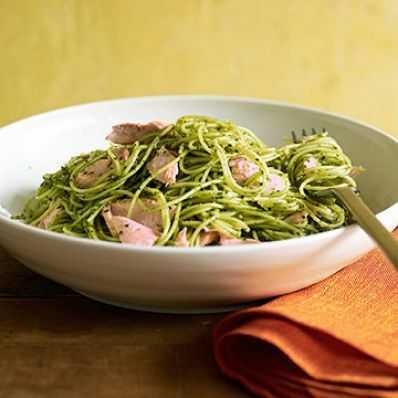 Toss drained pasta with 1 cup pesto and 1/4 cup of the pasta water, adding more water if needed. Remove skin from salmon; discard. Flake fish into pasta.